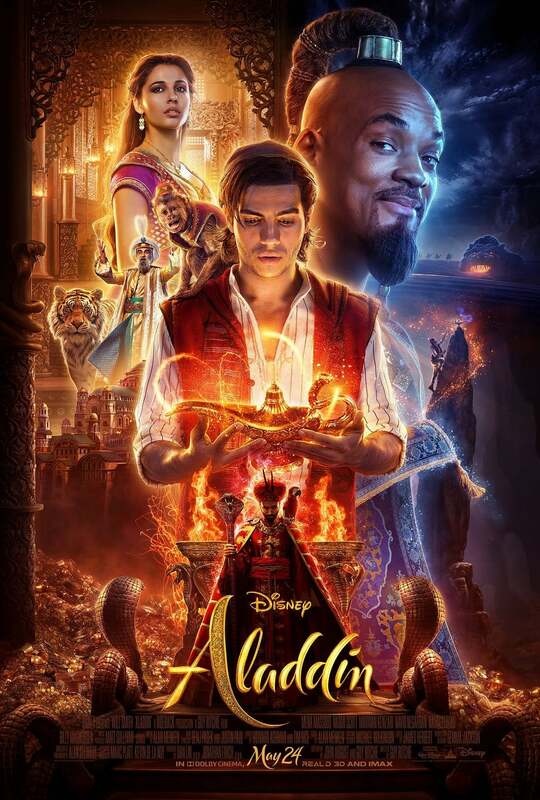 In addition to the arrival of the full-length Aladdin trailer on Tuesday morning, Disney unveiled a colorful new poster for the upcoming live-action adventure. For fans of the the Marvel Cinematic Universe, this poster will look incredibly familiar. It utilizes many of its main characters by cutting and resizing them all over the poster. Aladdin is front and center, with Genie and Jasmine above him. The evil Jafar is positioned at the bottom center of the poster, poised to unleash his wicked plans. The poster is certainly busy, but that doesn't mean it isn't fun to look at and study. The more time you spend investigating this poster, the more hidden Aladdin gems you'll discover. Take a look! This new Aladdin movie is an updated, live-action version of the classic Disney animated film from 1992. While some of the early promos and teasers made it look like this would simply be a shot-for-shot retelling of the original story, the full-length trailer confirms that there will be plenty of differences, many centered around the portrayal of the Genie. Robin Williams delivered an iconic performance as the blue wish-granter in the animated film, but Will Smith takes over in Guy Ritchie's adaptation, delivering a much different performance. You can check out Disney's official synopsis for Aladdin below. "A thrilling and vibrant live-action adaptation of Disney’s animated classic, Aladdin is the exciting tale of the charming street rat Aladdin, the courageous and self-determined Princess Jasmine and the Genie who may be the key to their future. Directed by Guy Ritchie, who brings his singular flair for fast-paced, visceral action to the fictitious port city of Agrabah, Aladdin is written by John August and Ritchie based on Disney’s Aladdin. The film stars Will Smith as the Genie; Mena Massoud as Aladdin; Naomi Scott as Jasmine; Marwan Kenzari as Jafar; Navid Negahban as the Sultan; Nasim Pedrad as Dalia and Billy Magnussen as Prince Anders." Are you looking forward to Disney's Aladdin? What do you think of the new trailer and poster? Let us know in the comments! Disney's Aladdin is set to hit theaters on May 24th.